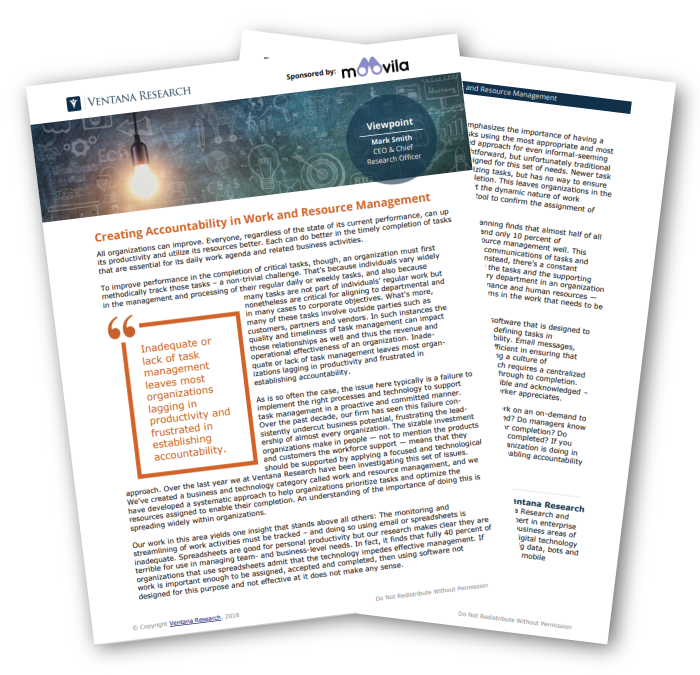 If you are not confident in what your organization is doing in work and resource management, it is time to consider a better path to enabling accountability and optimal productivity. Over the past decade, our firm has seen this failure consistently undercut business potential, frustrating the leadership of almost every organization. The sizable investment organizations make in people — not to mention the products and customers the workforce support — means that they should be supported by applying a focused and technological approach. Over the last year we at Ventana Research have been investigating this set of issues. We’ve created a business and technology category called work and resource management, and we have developed a systematic approach to help organizations prioritize tasks and optimize the resources assigned to enable their completion. Improve work and resource management, download the viewpoint!